Most if not all states have a government website with information on all the documents required for your marriage license. These sites will also have the office’s contact information. Once you know what city, district, and county you will be married in, you will need to locate the office where you will obtain the license. This may be the city hall, clerk’s office, or marriage license bureau in this county. It is also important to be aware of timeframes. Some states require a waiting period between granting the license and your wedding taking place. Most marriage licenses are also only valid for a certain period. During this window you must hold the ceremony, sign the license together with the officiant, and file for a certified license and marriage certificate. Current processing and delivery time may vary by state or certificate. In most cases, it is approximately 5 to 7 business days (excludes weekends and holidays). Additional delivery times apply if you choose to have the certificate delivered by regular mail. Detailed delivery times will be listed on the application. What is a maiden name or legal name change? A maiden name is your last name at birth. If you have had a legal name change your original vital records would have been permanently changed either by yourself or the courts. Your new legal name would be your new maiden name. Taking your spouse's last name is not a legal name change and would not have altered your original birth vital record. What name do I use if adoption was involved? Use Adoptive Parent's names, unless there has been a legal name change. Can I order anyone’s Marriage Records? 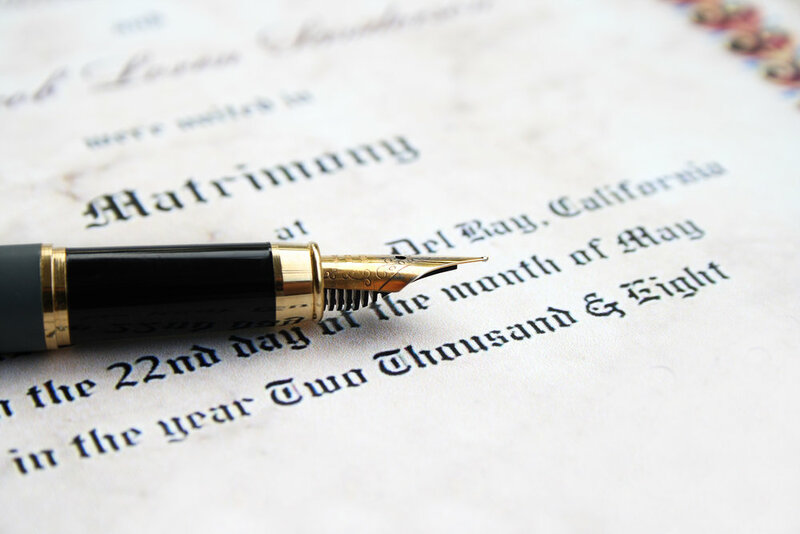 In most cases, copies of marriage records may be obtained by anyone who can provide sufficient search information. How much does it cost to order a vital record and what are the fees? Pricing will vary depending on the state the certificate is issued from, to review the costs of ordering your vital records, please navigate the vital records website to the appropriate state and consult the pricing chart listed on the certificate page/the bottom of the application. What if I don’t have all of the information to complete the order form? The government agency issuing your certificate requires certain information to process your request. If you cannot obtain the information required, you may wish to discuss this in person or by mail with the vital records office responsible for the certificate.